The Corseca Amigo sound bar is equipped with Bluetooth 4.2, and ships with a pair of 6Watt RMS drivers to deliver output with a total frequency response of 100Hz - 15 KHz. 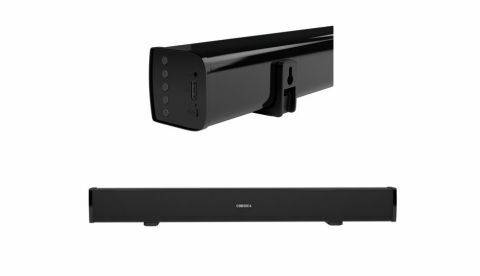 Corseca has launched 12W RMS Amigo Sound Bar for Rs 3,999 in India. The sound bar is equipped with Bluetooth 4.2, and ships with a pair of 6Watt RMS drivers to deliver output with a total frequency response of 100Hz - 15 KHz. It has a 1500 mAh rechargeable lithium ion battery, which they claim can deliver 5-6 hrs of continuous wireless audio streaming. Damson Technologies, an OEM player and manufacturer of computer peripherals, accessories and lifestyle products in the Indian market, today launched the CORSECA Amigo, a 12W RMS Sound Bar for immersive audio experience. The product is a perfect companion for music fanatics looking for an epic playback performance be it classical opera, rock n roll, hard rock or Bollywood chart-busters. "By blending state-of-the-art technology with incredible design, Corseca Amigo pairs perfectly with any devices like LED television, desktop, laptop or smartphone. Riding on its clean living room concept, Amigo lets customer enjoy music and movies seamlessly," said Sandeep Popli - Director Sales at Damson Technologies. With Corseca Amigo, consumers will get theater like audio experience at their home. Equipped with latest 4.2 version of Bluetooth, the device packs 2 powerful 6Watts RMS drivers output to regale users with perfect musical balance and tonal quality. The device delivers deep, accurate bass with a frequency response of 100Hz - 15 KHz. Boasting a rechargeable 1500 mAh lithium battery for 5-6 hrs of continuous wireless audio streaming, this device weighs just 920gms making it lightweight, compact and portable. With different connectivity options such as; Bluetooth, USB, TF Card Reader, AUX in Port and FM, Amigo lets users enjoy music in multiple forms. Driven by innovations, Corseca products exemplify elegance and performance to help users upgrade their living room. CORSECA Amigo (Black) comes with the MRP of Rs. 3,999/- carrying a warranty of 1year and is available immediately from Damson's network of authorized retailers and distributors.